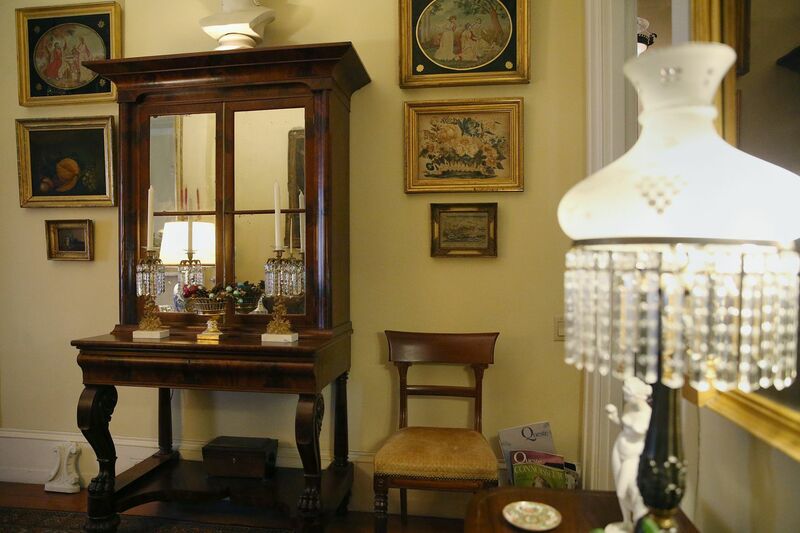 Jack Murray's living room is filled with antiques, including a secretary desk, circa 1820s, made by Anthony Quervelle. Built in 1850, the Greek revival rowhouse in Center City Philadelphia was probably occupied then by middle-class merchants. No one knows exactly what the interior looked like, but the period still lives there, thanks to the efforts of a former museum official and his art teacher aunt. The current homeowner, Jack Murray, 74, retired as exhibit director at the University of Pennsylvania Museum. His relationship with the house goes back to the mid-1950s, when it was occupied by two unmarried aunts. Margaret and Clementine Canovaro had bought the four-story building in 1944 — it had been converted to a rooming house — and Murray was there often. Jack Murray next to a painting of his aunt, Margaret Canovaro, who formerly owned his home in Center City Philadelphia. Clementine wasn’t that into interior decorating, Murray recalls, preferring to concentrate in the kitchen: “The best Italian cook in Philadelphia” in his unbiased opinion. But Margaret was a devotee of antiques, and as she stocked the house, Murray learned from her. Some of the pieces came from her worldwide trips. Mead quickly backed off, Murray said. Jack Murray's Aunt Margaret swiped a Japanese screen from him when she turned a food preparation room into a sitting room. Perhaps the biggest change in Queen Margaret’s reign was the conversion of the food preparation room adjacent to the kitchen into a sitting room. A staircase leading to the upstairs dining room was walled off. Margaret also modernized the kitchen, replacing an ancient gas-fired refrigerator. She purchased tiles on one of her trips to Portugal and supervised the placement of each one on the kitchen backsplash. The kitchen backsplash tiles came from a trip to Portugal. Margaret died in 1984, “and when she was finished, I began,” Murray says. He moved into the house from his apartment in 1991 and inherited it in 1995 on the death of Clementine. In the living room, he got rid of a historic 1830 New York sofa because it was “uncomfortable,” donating it to the Philadelphia Museum of Art. Margaret had added a Loud and Brothers (Philadelphia) pianoforte from about 1830 and an Anthony Quervelle secretary from the 1820s. The living room features a Loud & Brothers pianoforte from about 1830. He painted the second-floor dining room red and added Duncan Phyfe chairs and a French Empire table. In his bedroom, he installed a screen from the Japanese Edo period similar to the screen in the sitting room. Original touches including the banisters and mahogany spindles and the marble vestibule were retained. While his portion of the house — there are three apartments upstairs — seems filled, Murray isn’t sure his antique buying days are over. Jack Murray painted the dining room red and added Duncan Phyfe chairs and a French Empire table.